Whether you’re moving across town, across the country, or across the street, moving day is stressful. Some might argue that it doesn’t matter how far you are moving, it can be equally as frustrating no matter how big the distance. 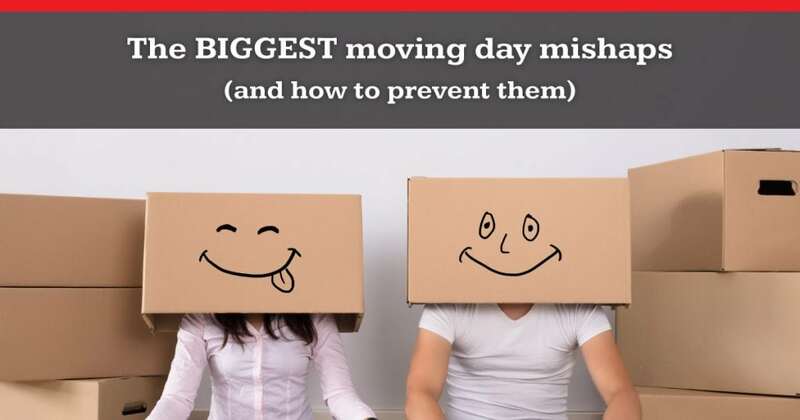 Planning for moving day is the key to making it go smoothly, but even the best plans can be upset by unexpected issues. Everything is packed. You’ve thought of everything. You’re excited to get started and get this move going. Then you wake up on the morning of the move, and there’s a new and unexpected foot of snow in your driveway. Maybe you wake up to an obscenely hot and sweaty day — one of those days where it’s only 7 am, and it already feels like it’s 90 degrees! Whatever the issue, whether it’s driving rain, fog, snow, high heat, there are ways to deal with it. If extreme cold or heat is your issue, make sure that anything temperature sensitive is protected. If you have items that could melt, like candles, consider getting a cooler. Also, prepare yourself for extreme temperatures. Wear sunscreen, layer your clothing for cold days (especially moving items inside and out), and have lots of water available for hot days. Also make sure that you’re taking breaks as needed, no matter what the weather. If you’re working on snow or ice, be sure to put down traction for everyone. Sand or salt can help keep driveways and steps clear or, at least, not slippery. Be sure to put towels or throw rugs down on floors if you will be walking through sand, dirt, or other debris. Pretend for a second that you have moved into your new home. You got everything inside, laid out an air mattress, and crashed. You can still see the remnants of take-out on the new kitchen counters. You feel better in the morning, and everything is exciting and bright. You’re eager to get started unpacking and sorting your new home. First, you need some coffee. But where’s the coffee pot? Ugh. Who knows? Packing an essentials box for those first moments in your new home can save you frustration and a caffeine-deprived morning. A coffee pot (or instant coffee), coffee mugs, some flatware, and any other small items you might need like a knife to cut open boxes, a screwdriver, a hammer, and some duct tape will get you through almost any issue you might come across on your first days in your new home. One of the worst things that can happen on your moving day is to hurt yourself or have someone in your family or moving crew get hurt. Keep a basic first aid kit nearby at all times. A good rule of thumb, especially if moving a long way, is to have a backpack filled with small essential items, including a first aid kit, a toolkit, a sewing kit, a water bottle, and anything else you might need. In addition, you should also be sure that your movers are properly covered by insurance. A good moving company should provide you with proof of workers comp coverage. Without it, you could find yourself responsible if anything happens to your movers while they’re on the job. This coverage is actually legally required, but you’d be surprised how many small and medium-sized moving companies don’t have it. Always check first! Little kids will be excited to move — and they’re going to want to help! Be sure to keep little ones safe by either designating a person to watch them or by keeping them in sight at all times if you’re helping, too. Pets might be better off in a kennel or at doggie (or kitty) daycare. Hiring a sitter (for either kids or pets) can be the best option. This keeps the kids occupied and safe all day while the “heavy lifting” is happening. Even the most organized person can have troubles on moving day. Consult with a local moving company to make sure any and all circumstances are taken care of ahead of time. A trustworthy moving company can be the key to a smooth moving day — or one filled with anxiety and frustration. Marrins’ Moving is experienced and efficient. Our team of experienced, expert local movers will help you get to your new home with less stress. Call today to see how Marrins’ Moving can help you sort out the best way to get moving.